Cleaning Update –Check out the progress. I want to start out by thanking everyone who is reading and commenting on the blog. I really appreciate it. The messy house video is sure getting a wide variety of reactions. If you haven’t seen the video, click here. One viewer was so appalled he said he was going to hop on a plane to help clean, if necessary. @mogelsonlevy had a great suggestion for all of the school homework. She scans her kids memorable projects into her computer and then makes a DVD each year. That way, she and her kids can look back without the clutter. I heard from some folks who said they felt like they were in the same boat and they could relate to my house of heaps. It made me feel better. Then I heard from someone else who said her problem is just the opposite. She is a perfectionist and her goal for 2011 is to let a few things go. She feels that she is so worried about the shape of the house it interferes with quality family time. My goal with this massive cleaning is to get more organized, so it will be easier for all of us to be neater long term. Everything will have a place to go. What’s the point of doing all of this work if I am going to turn around in two weeks and find it looks the same as it did in the BEFORE video.?? 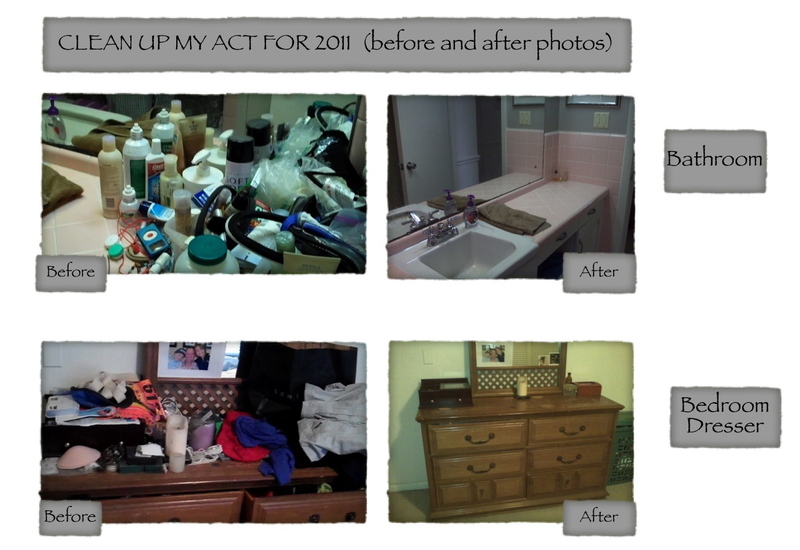 For example, in the bathroom, I emptied out the linen closet and all of the drawers, creating space for all of the toiletries that had been on the counter. I filled up six garbage bags with vintage items like a pain-killer prescription from 1998. I remember getting it after the birth of my son. Then there was the jar of Bugs Bunny vitamins that expired in 2005. I also discovered some old makeup from 2002. It’s MAC. I think I was saving it for the recycling program. Do they still have that? As I purged, I also uncovered a lot of dust. A big thank you to my husband who took out all of the trash bags and followed me around the house with a vacuum and duster. As for the Halloween Candy, it’s still here. In fact, I am nibbling on a KitKat right now as I write this. I liked Amy’s idea of weeding through it because there are definitely a few treats that no one in our family would ever eat. I just don’t know if I have the patience to do it. I might try @tweenmom’s idea during winter break and invite some boys over for ice cream with candy bar bits. My son suggested we try to make blizzards. After that, the candy selection should be nice and picked over, and I can toss whatever is left without feeling too badly about it. ← Halloween Candy. Keep it? or Dump it? A quick shout out of “THANKS” to the person who gave us the Baby Jesus tree ornament for the birth of our first son in 1998! Just one of the many items we uncovered during the mass cleanout. You made my morning with that video. I especially appreciate the vodka & VHS tapes. HA! I just tossed those a couple weeks ago (the tapes, not the vodka). I intentionally save my cleaning for the winter months so I don’t lose valuable time on the golf course. Coming along nicely. Keep up the good work!